And then she said to Annika, "Why don't you feel in that old tree stump? One practically always finds things in old tree stumps." Remember that other classic of children's literature, wherein a boy runs from the city to a secluded mountain, taking up residence in an old tree he hollows into a cozy shelter? 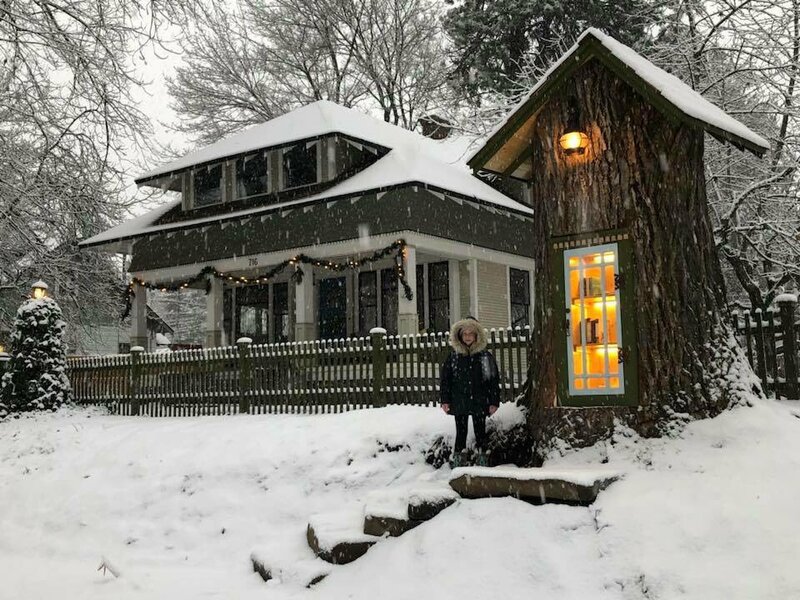 Public librarian and artist Sharalee Armitage Howard’s Little Free Library is a bit like that, except there was no running involved. When the venerable and ailing cottonwood in her Coeur d’Alene front yard began dropping branches on cars parked below, Howard faced the inevitable. But rather than chop the tree even with the ground, she arranged with the removal crew to leave a considerable amount of stump intact. Then, in a Pippi Longstocking-ish move, she filled it with books for her neighbors and strangers to discover. The interior has a snug, woodland vibe, worthy of Beatrix Potter or Alison Uttley, with tidy shelves, soft lighting, and a shingled roof to protect the contents from the elements. Ever since December, when Howard posted photos to social media, the fairytale-like structure has been engendering epic amounts of global goodwill. 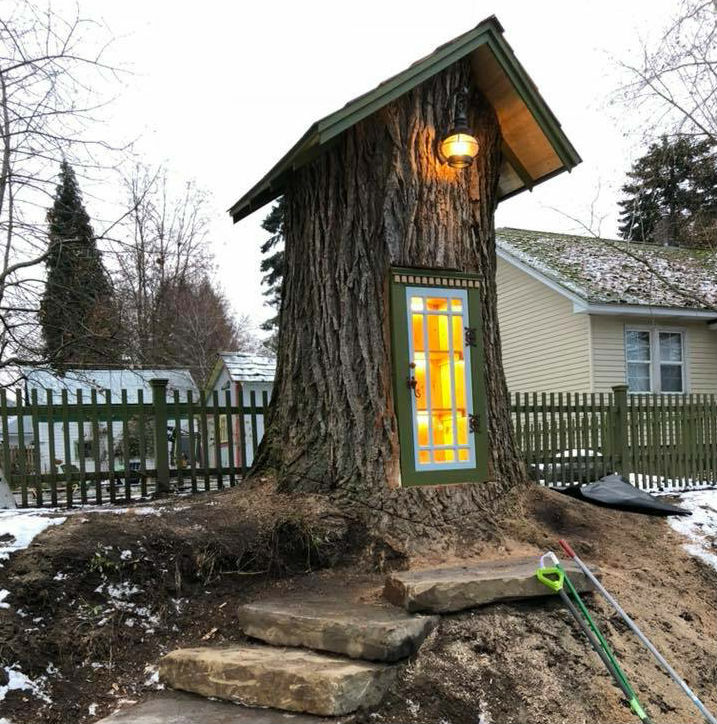 What a beautiful way to preserve and honor a tree that stood for well over a century. It's like a house of horrors for trees. Inside the corpse of their former comrade are the processed remnants of their treebrothers and treesisters. Visit Howard’s Little Free Library (charter #8206) the next time you're in Idaho. Or install one of your own. What a lovely refurbishment for a stately old tree. Libraries make the world a better place.The creator should take a “bough” for this little “branch” library. Cool idea! However, it’s only a matter of time before the local Code Inspector or zoning-board comes after her. Big Government in too many places doesn’t like people competing against their public libraries!